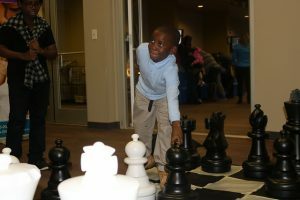 One glance around the Robert R. Freeman Administrative Complex and you can see the ‘Family Matters: Game Night’ event is a success. Multiple families filled the tables in the boardroom to play games with their kids. 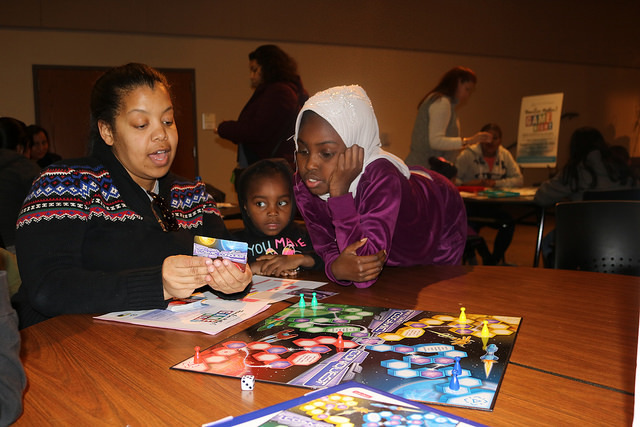 Game Night, hosted by the DeKalb County School District’s (DCSD)Department of Parent & Family Engagement, consisted of educational games for all grade levels to help with the alphabet, rhyming, place value, and more. Her sons spent some of the evening playing with the life-size chess game. But life-size chess wasn’t the only option for the children in attendance. There was life-size Connect Four, Jenga, and bowling pins. As for “regular-size” games, there were plenty of those as well. This is the second year for the event geared at gathering families for quality time and educating the kids.